Welcome to the future of radio trading. Utilising next generation proprietary technology, Radio Trading Desk is an automated cloud-based platform that enables any advertiser from any sector to quickly create an advertising campaign that best fits its marketing goals and budget. Every week, hundreds of broadcasters’ available inventory is brought to Radio Trading Desk. Advertisers in market benefit from an automated reverse auction model, leading to low market prices. The Radio Trading Desk team of specialists are on hand for training and support to help you set up the optimum campaign to maximise your results. We can also provide commercial production services at very low rates. The Radio Trading Desk platform saves you the time of connecting and negotiating with broadcasters to get the best deals. Access stations from one dashboard, and make savings on direct rates by purchasing the stations unsold inventory at the last minute. Our unique user friendly self-service platform means you set your campaign criteria based on your marketing needs, and you decide how often to advertise with no long term contracts. Our platform allows you to select your campaign criteria including regions, stations, audience profile, dayparts, budgets, and maximum CPTs/costs. Every week broadcasters join an automated marketplace auction to sell their available inventory. This is actually a reverse auction model where the lowest prices win. Your activity is confirmed with final delivery and cost details. Radio Trading Desk handles all trafficking of your commercial. The radio stations run your commercials on air the following week. Enter your campaign parameters (regions, station white list, days, dayparts, etc.) 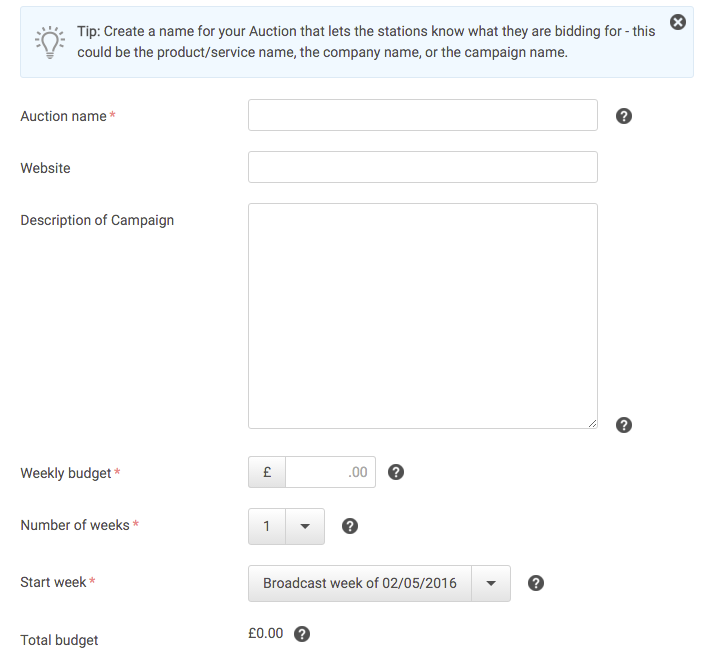 and upload your radio commercial to create your auction. Our Account Managers are available to help you get started if you have any questions. 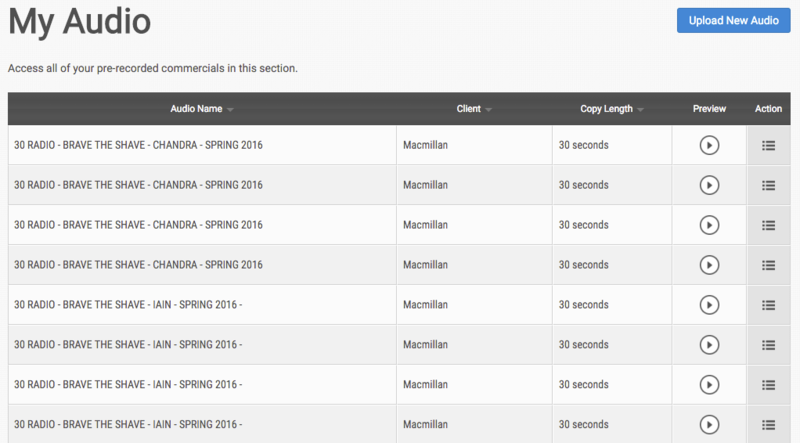 Upload your radio commercials, and access audio from your previous auctions in the 'My Audio' section. Radio Trading Desks also provides creative production resources, to create effective commercials for your campaign – starting from just £1,000. When you log into your Radio Trading Desk account, you'll find a quick-view area with your most recent auctions, audio, and campaign details. You can choose to view your auction history or any pending auctions for future weeks. Information about your auctions is stored in easy-to-use reports, which can be printed or exported. You can quickly find a summary of the radio stations that played your commercials by day and daypart. Let us connect you with cost-effective, best-in-class services. The Radio Trading Desk is pleased to offer you access to our in-house creative production company who is on hand for all your professional audio and production needs. Services include copywriting, voice talent, commercial production, podcasts, audiobooks and station imaging. For advertisers that need to be specific we also plan and buy bespoke airtime across micro, local, regional and national radio stations. Speak to our team of highly experienced radio specialists to accommodate your planning and buying needs. Radio offers a wide variety of advertising opportunities that go beyond the spot. Sponsor the traffic, weather, news, run on-air competitions, live promotions or themed content. We're specialists at integrating your brand into radio and understand how to engage listeners. We can offer you access to additional advertising opportunities via online audio and music streaming platforms such as Spotify, SoundCloud and Deezer. We also utilise DAX and inStream, available on talkSPORT, Absolute, Kiss, etc. as well as the feature rich UK Radioplayer apps and players. The Radio Trading Desk, and before it Bid4Spots, has enabled us to utilise any unsold inventory in a structured and controlled manner. Significantly we are able to determine which stations, which days and at what price we are prepared to accept late bookings without compromising our output or programmes. The bidding process is clear and concise, and takes just a few minutes each week. Audio delivery is automated and efficient. The Radio Trading Desk has helped our company to raise significant extra revenues which we would not otherwise have had. We’ve been using the Radio Trading Desk, and before it Bid4Spots, consistently for various clients for over 5 years, with campaigns including Quick Quid, Vonage and WWF. Because we set the maximum CPT, and other targeting criteria, our clients are guaranteed to be getting great value, decreasing cost per lead and increasing ROI across the board. 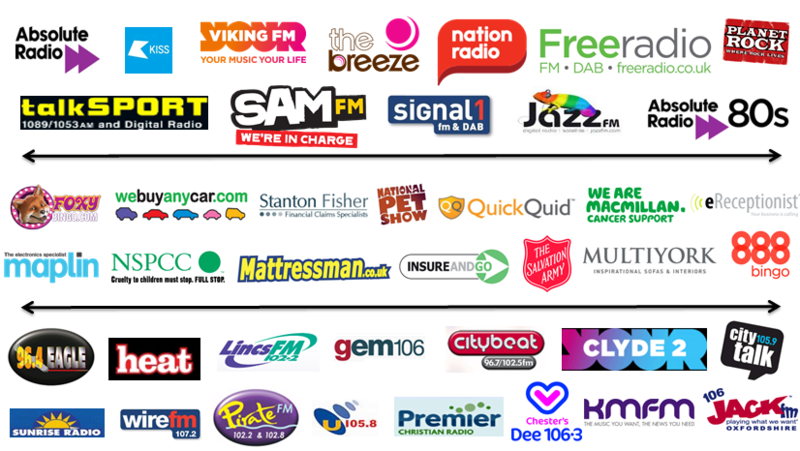 Radio Trading Desk have access to hundreds of stations across the UK, making it extremely easy to book an effective campaign on any scale and it allows us to enjoy the flexibility of being able to book on a weekly basis. on the radio without having to sell to them. The Radio Trading Desk works with a wide variety of advertisers with a range of marketing objectives. Our business has been built on advertisers achieving a great response from their campaigns. They come back again and again. From retail to B2B to online businesses, our advertisers are in market seeking inventory on a week to week basis. Radio Trading Desk provides access to this demand, and lets you control what you sell via an easy to use self-service dashboard. Speak to our specialist team about supply side arrangements. Receive an automated invite to bid in auction for activity running in the upcoming broadcast week. Listen to each advertiser's audio in advance and decide if the content is appropriate for your listeners. No need to play out filler spots for free, when you can monetise your unsold inventory on a week to week basis. There is an untapped source of radio revenue which is difficult to reach using standard selling methods. The Radio Trading Desk brings those advertisers to radio stations every single week. 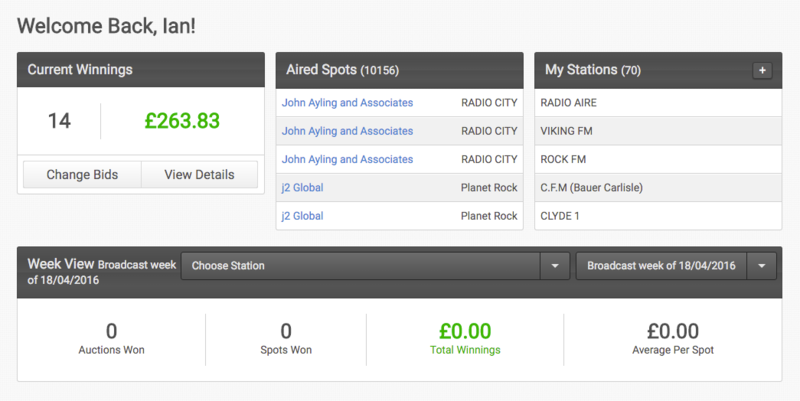 We give radio stations 100% control of the bidding process. They decide the advertisers for which they would like to bid, how much inventory to put into the auction, and what rates to offer each week. For nearly a decade, the Radio Trading Desk (formerly Bid4Spots) has partnered with commercial radio stations using their RAJAR figures to determine winnings via a weekly auction that focuses only on the next week's inventory.